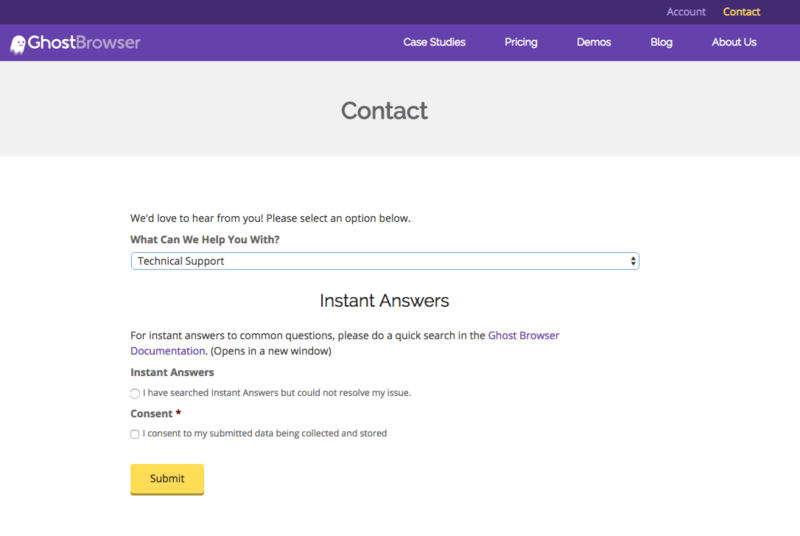 If you find a bug in Ghost Browser, please send us a report to let us know. This issue report will provide information vital to debugging the issue. From Ghost Browser, click the three-dot browser menu in the upper right corner and select Report an Issue. Enter the message subject, your first and last name and your email address in the respective fields at the top of the form. Note: Please make sure your email address is correct or we can't respond to you! Enter as much information as possible about the bug in the text box. Include the exact steps to replicate the issue. - If possible make a screen recording of the issue happening. If we can see it in action we can troubleshoot it much faster. Loom is a good free screen recording solution and will provide you with a link to the video to send to us. Select the Include this screenshot checkbox to automatically include a screenshot of your active tab. This is optional but very helpful, so please check this box. 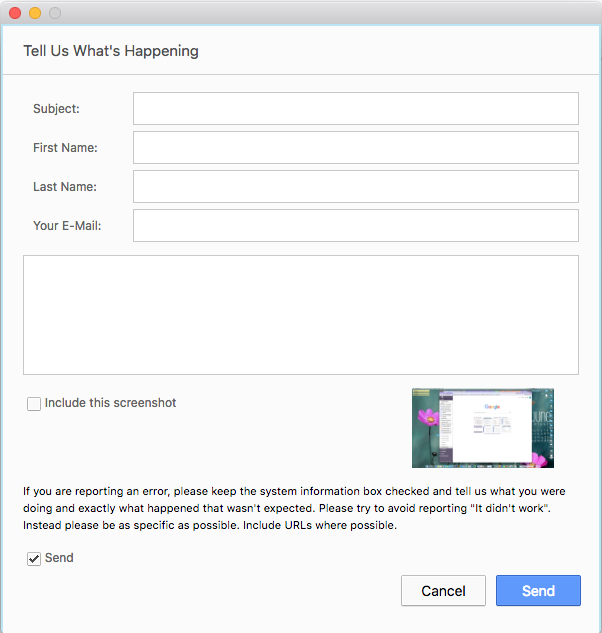 The Send system information checkbox is automatically selected in order to include your OS, browser version, installed extensions, license information, and currently open URLs. This option is selected by default because this information is critical for us to troubleshoot the issue you're reporting. We'll get back to you as soon as possible, usually within 24 hours if you're a free user and same day if you're a premium user. Before contacting Support, be sure to check our Knowledge Base for answers to common questions. From Ghost Browser, click the three-dot browser menu in the upper right corner and select Report an issue. This is the best way to contact us if you are having technical issues. Ghost Browser Support is available 9 AM to 5 PM Monday through Friday, Mountain Time (UTC -7). We are located in Denver, Colorado. Most support requests are handled the same day we receive them. For urgent requests, we’ll try to get back to you on weekends and after hours when possible.